Recent Arrival! ABS brakes, Alloy wheels, Compass, Electronic Stability Control, Front dual zone A/C, Heated door mirrors, Heated front seats, Heated Sport Front Seats, Illuminated entry, Low tire pressure warning, Power moonroof, Remote keyless entry, Traction control. 28/35 City/Highway MPG Liquid Platinum 2015 INFINITI Q50 Hybrid Sport V6 7-Speed Automatic with Manual Shift AWD INFINITI Certified Pre-Owned Details: * Warranty Deductible: $0 * Transferable Warranty * Roadside Assistance * Limited Warranty: 72 Month/Unlimited Mile (whichever comes first) Limited Warranty 72 months/Unlimited miles from original in-service date for vehicles over 15,000 miles & under 2 years old, 24 months/Unlimited miles from certified purchase date for vehicles over 15,000 miles & older than 2 years * Vehicle History * 167 Point Inspection * Includes Rental Car and Trip Interruption Reimbursement Awards: * 2015 IIHS Top Safety Pick+ Type your sentence here. Recent Arrival! ABS brakes, Compass, Electronic Stability Control, Front dual zone A/C, Heated door mirrors, Heated Front Seats, Heated front seats, Illuminated entry, Low tire pressure warning, Power moonroof, Remote keyless entry, Traction control. Odometer is 6432 miles below market average! 19/27 City/Highway MPG Graphite Shadow 2015 INFINITI Q50 Premium 3.7L V6 DOHC 24V 7-Speed Automatic with Manual Shift AWD INFINITI Certified Pre-Owned Details: * Vehicle History * Transferable Warranty * Warranty Deductible: $0 * Limited Warranty: 72 Month/Unlimited Mile (whichever comes first) Limited Warranty 72 months/Unlimited miles from original in-service date for vehicles over 15,000 miles & under 2 years old, 24 months/Unlimited miles from certified purchase date for vehicles over 15,000 miles & older than 2 years * Includes Rental Car and Trip Interruption Reimbursement * Roadside Assistance * 167 Point Inspection Awards: * 2015 IIHS Top Safety Pick+ ** AVAILABLE EXCLUSIVELY AT GEORGE HARTE INFINITI 1076 S COLONY RD WALLINGFORD, CT. CALL 866 853 6485. Recent Arrival! ABS brakes, Compass, Electronic Stability Control, Front dual zone A/C, Heated door mirrors, Heated front seats, Heated Sport Front Seats, Illuminated entry, Low tire pressure warning, Power moonroof, Remote keyless entry, Traction control. Odometer is 15485 miles below market average! 19/27 City/Highway MPG Liquid Platinum 2015 INFINITI Q50 Sport 3.7L V6 DOHC 24V 7-Speed Automatic with Manual Shift AWD INFINITI Certified Pre-Owned Details: * Includes Rental Car and Trip Interruption Reimbursement * Transferable Warranty * Vehicle History * 167 Point Inspection * Warranty Deductible: $0 * Roadside Assistance * Limited Warranty: 72 Month/Unlimited Mile (whichever comes first) Limited Warranty 72 months/Unlimited miles from original in-service date for vehicles over 15,000 miles & under 2 years old, 24 months/Unlimited miles from certified purchase date for vehicles over 15,000 miles & older than 2 years Awards: * 2015 IIHS Top Safety Pick+ ** AVAILABLE EXCLUSIVELY AT GEORGE HARTE INFINITI 1076 S COLONY RD WALLINGFORD, CT. CALL 866 853 6485. Visit our INFINITI dealer near Meriden, CT, to browse our used INFINITI financing offers and buy a pre-owned INFINITI. We have many popular used INFINITI cars and SUVs for sale, including used INFINITI Q40 and Q50 sedans. You can finance a pre-owned INFINITI Q60, or upgrade to the spacious interior of a used INFINITI QX50 or QX60. Our financing experts are standing by to lay out all your INFINITI loan options and get you behind the wheel of a high-quality pre-owned INFINITI that you love. 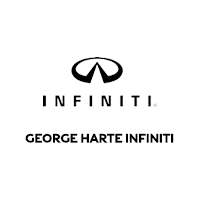 Learn more about our used INFINITI inventory, then visit George Harte INFINITI to test-drive the model that’s most appealing to you.